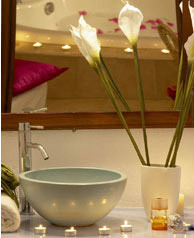 All rooms at Aroma Suites are fully furnished. They offer a kitchenette with fridge, air conditioning, direct dial phone, TV, safety deposit box, bathrobes & hair dryer, Satellite TV & Stereo System. 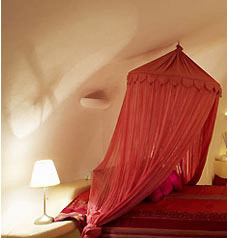 The Cave Houses Apartments are larger & have a traditional round vaulted ceiling. 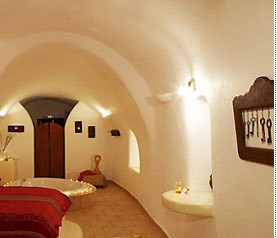 The Honeymoon Suite is also Cave House style is 50 sq. metres in size with a traditional round vaulted ceiling. It has a separate kitchen area, an Indoor Jacuzzi Bathtub, while the ' built in' large double bed has canopy drapes. Below you will find our official hotel rates, booking seasons & an easy to complete form to make your reservation or simply an inquiry for additional information. It would be helpful if you completed all fields. All other rooms rates are per room type. 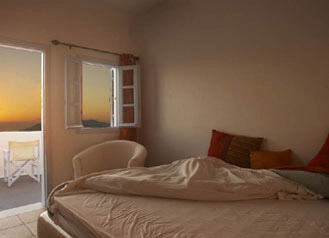 All rates are in Euro per night including taxes. We accept all major Credit cards. Bookings for Single Room Occupancy are accepted. Continental Breakfast on request : 12 euro p.p. / day. Internet Users receive a Discount for Online Reservations (There are no discounts for the Winter period). You can check room availability for the booking dates of your preference. There are SPECIAL OFFERS every day! SPECIAL OFFER: BOOK ONLINE NOW AND GET 5% DISCOUNT. IN CASE YOU HAVE DIFFICULTIES WITH OUR ON LINE BOOKING SYSTEM, you can use our Request form. It would be helpful if you completed all fields.